New Brunswick has many roadside attractions, hidden gems and unique places to add to your next road trip! We created this resource in hopes that you slow down, take time to explore and stop a while next time you are on the road in New Brunswick. These are short stops, not activities that take hours, but a place to stop, look, have a bite to eat or stretch your legs. Pack a picnic lunch and bring your camera, snap a photo at some of these fun attractions. Feel free to share on social using hashtag #StopToSeeNB so we can see all the fun you have! Watch for more details coming on Attractions around New Brunswick, that will require more planning and time to enjoy. Or visit our Day Trips In NB post here, we are adding to this post as we visit more places. If you can be in Saint John long enough to see the tides come in and go out, you will see the "reversing" of the falls. Reversing Falls can be seen from a couple viewpoints, but Falls view Park (off Douglas Ave) is the best viewpoint to experience the sights and sounds. Bronze Moose - A bronze sculpture of a Bull Moose that the artist named the Moosehead Challenger, is located outside Market Square, along the Market Slip Boardwalk, in Saint John, NB. 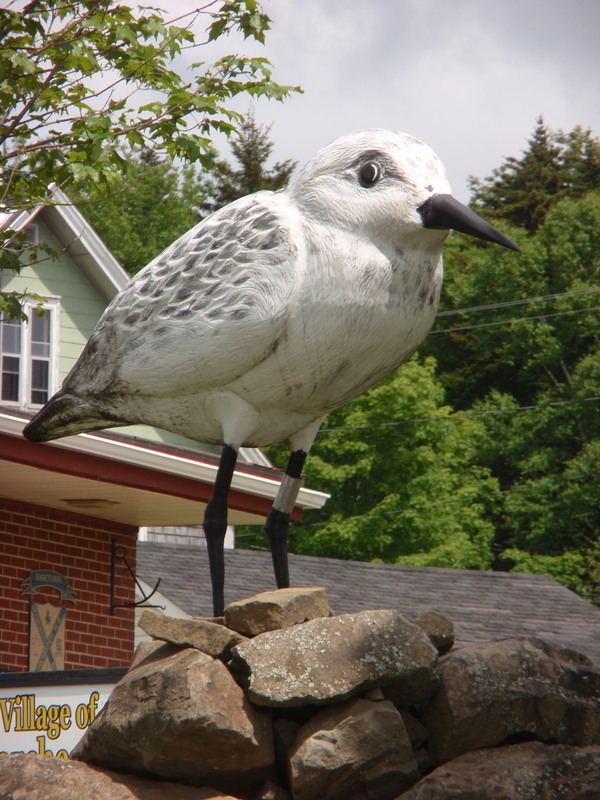 Sculpture Trail - There are sculptures all over Southern New Brunswick, made from stone found in local quarries. You can download a map, or their app here. Giant Blueberry - Located at Granite Town farms storefront in St. George. Visit their website and you can even book a tour of the family owned Wild Blueberry Farm. Covered Bridges - New Brunswick is known for it's covered bridges. Here are the ones in the Saint John and Southern Region of NB. Murals in Sussex - There are 27 panoramic murals around town, making it a lovely drive and stop on your NB Road Trip. Cow and Calf In Sussex - Stop for a break at the larger than life Cow and her calf, representing Sussex as the Dairy Capital of the Maritimes. (Smith's Creek Rd, off Route 1 at exit 195, across from Irving gas station in Four Corners, NB, Sussex Area) The perfect pit stop with ample parking, a gas station across the street with washrooms and coffee. "Blowhard" The Bony Horse - Located in Penobsquis NB, as part of the Animaland Campground. Covered Bridges - New Brunswick is known for it's covered bridges. Here are the ones in the Sussex Region. Magnetic Hill - The Giant Magnet at the entryway to Magnetic Hill is a great spot for a photo! Magnetic Hill is an optical illusion. Drive down the hill, put your car in neutral and it will go backwards up the hill. There is a fee for access to this attraction. While there, you can also visit the shops at the Magnetic Hill Warf Village, The Magnetic Hill Zoo, or Magic Mountain Water and Amusement Park. Situated just off Highway 2 at exit 450, take Magic Mountain Rd . Murals in Moncton - Take a walk around Moncton and see some of the more than 50 art works & sculptures. Here is a cultural map, including the murals created during Festival Inspire. World's Largest Silver Fox - There is a large sculpture of a Silver Fox at the Irving Big Stop on the Trans Canada Highway in Salisbury, NB. World's Largest Sandpiper - Created from a single log, this wood carving of a Sandpiper is located on Main St in Dorchester, NB. Each year, between mid-July and mid-September, more than 80% of the world’s Semipalmated Sandpipers flock to the shores of Johnson’s Mills. Large Moose - Situated in front of the Mouse'n Around gift shop in Alma, NB. Covered Bridges - New Brunswick is known for it's covered bridges. Here are Covered Bridges in the Moncton & Fundy Region. Canada's Largest Fishing Hook - The Veteran’s Fly, located at the corner of Main Street and South Bartholomew Road in Blackville, NB, was conceptualized by local business owner Hugh Hallihan in 2005, the Year of the Veteran. McNamee / Priceville Footbridge - At 200 meters, this is the longest suspension footbridge in New Brunswick, spanning the Southwest Miramichi at McNamee, approximately 12 km west of Doaktown. Covered Bridges - New Brunswick is known for it's covered bridges. Miramichi and Central NB covered bridges are listed below. Giant Lobster - In 1989 the 35 ft long lobster was commissioned by the Rotary Club. Shediac is known as the Lobster Capital of the World and the giant lobster attracts on average 500,000 visitors a year! Located at 229 Main St, Shediac, New Brunswick. Lighthouses on the Acadian Peninsula - There are many located all over the province, Here are the ones on the Acadian Peninsula. Covered Bridges - New Brunswick is known for it's covered bridges. Here are Covered Bridges in the Shediac & Acadian Coastal Region. Harvey's Big Potato Man - Large cement potato in front of a local vegetable stand. Located at 701 Rte 105 Hwy, Maugerville, NB. Large Fiddle - Located on Route 3 and Poplar Lane in Harvey, New Brunswick. Dedicated to the memory of hometown fiddling hero Don Messer, who died in 1973. Rollie MacLean, a local craftsman and master welder, built the fiddle in his workshop in his spare time. It stands at 15 ft. tall. Yogi Bear and friends - statues at the Jellystobe campground in Woodstock, NB. Noah's Ark Cafe - Serving homestyle soups, chili & nachos, home baked goods & coffee, and now serving ice cream! For the busy business traveler, they have free Wifi! (350 Burnham Road, Oakland, NB) All profits from Noah's Ark Cafe go to charitable activities. Covered Bridges - New Brunswick is known for it's covered bridges. Here are Covered Bridges in the Fredericton & Western NB Region. Grand Falls Gorge - The falls have a height of 23 meters (75 feet) formed by the flow of the St. John River. You can descend steps from the tourist information center (details of fees). Miniature Village - The Place des Pionniers (Pioneers Place) is a small-scale reproduction of the village of Saint-François, formerly known as Ledges. Restigouche Sam - Restigouche Sam is an 8.5 meter (22 ft.) stainless steel model of the a salmon. Located in Campbellton, NB. Covered Bridges - New Brunswick is known for it's covered bridges. Here are Covered Bridges in the Nothern NB Region. Our goal with our Stop & See New Brunswick Series is to share what NB has to offer tourists and those who call it home. I have lived in New Brunswick for 40 years, was raised here most of my life and am raising my family here. Through exploring the region we live in, we offer our children a sense of belonging and true pride in where they are from. We travel and explore where we are from, Atlantic Canada, and more specifically, get to know New Brunswick as much as possible. I learn about new and amazing sights and history about our province all the time. If you are from here, or from away, get out and explore New Brunswick.